Wind farms in China and small-scale solar panels on rooftops in Europe were largely responsible for last year’s 32% rise in green energy investments worldwide, according to the latest annual report on renewable energy investment trends issued by the United Nations Environment Programme (UNEP). 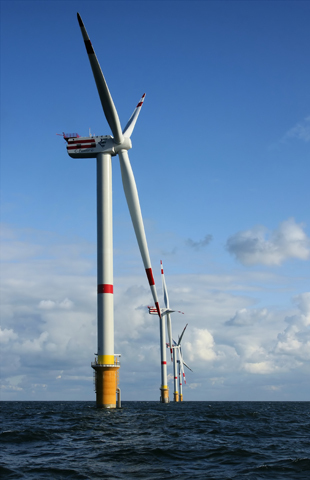 Offshore wind farm using 5MW turbines REpower M5 in the North Sea off Belgium. Newly constructed windmills D4 (nearest) to D1 on the Thornton Bank, 28 km off shore. The windmills are 157 m (+TAW) high, 184 m above the sea bottom. Photograph and caption courtesy of Wikipedia. UNEP and Frankfurt School launch Collaborating Centre for Climate and Sustainable Energy Finance. Last year, investors pumped a record US$211 billion into renewables, about one-third more than the US$160 billion invested in 2009, and a 540% rise since 2004. For the first time, developing economies overtook developed ones in terms of "financial new investment," spending on utility-scale renewable energy projects and provision of equity capital for renewable energy companies. On this measure, US$72 billion was invested in developing countries vs. US$70 billion in developed economies, which contrasts with 2004, when financial new investments in developing countries were about one quarter of those in developed countries. The report, "Global Trends in Renewable Energy Investment 2011", which will soon be available online, has been prepared for UNEP by the London-based Bloomberg New Energy Finance. It was launched on July 7, 2011 by UN Under-Secretary-General and UNEP Executive Director Achim Steiner and Udo Steffens, President and CEO of the Frankfurt School of Finance & Management, as it was also announced that a new UNEP Collaborating Centre for Climate & Sustainable Energy Finance is being inaugurated at the Frankfurt School. Asian developing countries excluding China and India: up 31% to US$4 billion. Another positive development with implications for long-term clean energy developments that is highlighted in the report was government research and development. That category of investment climbed over 120 per cent to well over US$5 billion. “The UN Climate Convention meeting in Durban later in the year, followed by the Rio+20 summit in Brazil in 2012, offer key opportunities to accelerate and scale-up this positive transition to a low carbon, resource efficient Green Economy in the context of sustainable development and poverty eradication,” he added. “The finance industry is still recovering from the recent financial crisis,” said Udo Steffens, President of the Frankfurt School of Finance and Management. “The fact that the industry remains heavily committed to renewables demonstrates its strong belief in the prospects of sustainable energy investments." “The investment activity in the developing world is not only leading to innovations in renewable energy technologies. It will open up new markets as first mover investors are facilitating a range of new business models and support entrepreneurship in the developing world,” explains Mr. Steffens. The report points out that not all areas enjoyed positive growth in 2010: there was a decline of 22% to US$35.2 billion in new financial investment in large-scale renewable energy in Europe in 2010. But this was more than made up for by a surge in small-scale project installation, predominantly rooftop solar. Investments in Germany in “small distributed capacity” rose 132% to US$34 billion, in Italy they rose 59% to $5.5 billion, France up 150% to US$2.7 billion, and the Czech Republic up 163% to $2.3 billion. The price of PV modules per megawatt has fallen 60% since mid-2008, making solar power far more competitive in a number of sunny countries. Nevertheless, the report suggests that the small-scale solar market is likely to stay strong in 2011. Further drops in costs for solar, wind and other technologies lie ahead, the report says, posing a growing threat to the dominance of fossil-fuel generation sources in the next few years. Throughout the last decade, wind was the most mature renewable energy technology and enjoyed an apparently unassailable lead over its rival power sources. Wind turbine prices have fallen 18% per megawatt in the last two years, reflecting, as with solar, fierce competition in the supply chain. In 2010, wind continued to dominate in terms of financial new investment in large-scale renewables, with US$94.7 billion (up 30% from 2009). However, when investments in small-scale projects are added in, solar is catching up, with US$86 billion in 2010, up 52% on the previous year. With US$11 billion invested, biomass and waste-to-energy come in third in front of biofuels, which boomed at US$20.4 billion in 2006, but fell off dramatically -- to US$5.5 billion last year. The sharpest percentage jumps in overall investment were seen in small-scale projects -- up 91% year-on-year at US$60 billion, and in government-funded research and development, up 121% at US$5.3 billion, as more of the “green stimulus” funds promised after the financial crisis arrived in the sector. Two areas of investment showed a fall in 2010 compared to 2009: corporate research, development and deployment (down 12% at US$3.3 billion, as companies retrenched in the face of economic hard times) and provision of expansion capital for renewable energy companies by private equity funds (down 1% to US$3.1 billion). Clean energy share prices fell in 2010, with the WilderHill New Energy Global Innovation Index (NEX) down 14.6%, under-performing wider stock market indices by more than 20%. This showing reflected investor concerns about industry over-capacity, cutbacks in subsidy programmes and competition from power stations burning cheap natural gas. Acquisition activity in renewable energy, representing money changing hands rather than new investment, fell from US$66 billion in 2009 to US$58 billion in 2010. The two largest categories of M&A – corporate takeovers and acquisitions of wind farms and other assets – both fell by around 10%. The low price of natural gas, which was between US$3 and $5 per million BTU for almost all of 2010, hurt the growth of renewables, the report says. The price of natural gas was far less than it was in much of the mid-2000s before it peaked at US$13 in 2008. “This gave generators in the US, but also in Europe and elsewhere, an incentive to build more gas-fired power stations and depressed the terms of power purchasing agreements available to renewable energy projects,” says the report. The report launch marks the beginning of the new UNEP Collaborating Centre for Climate & Sustainable Energy Finance at the Frankfurt School of Finance & Management. Its goal is to develop cost-effective ways to reduce energy-related carbon emissions by mobilizing sustainable energy investments and strengthening their associated markets. This is achieved by working with financial institutions to develop technical know-how, innovative financing approaches and new forms of entrepreneurial and end-user finance. The Centre’s approach combines project implementation on the ground with research, think tank activities, training and education. One of Europe’s leading business schools, the Frankfurt School also builds and strengthens financial sector capacities in emerging markets and developing countries through consulting and training projects. Through its “Sustainable Energy Finance” centre, the Frankfurt School has implemented energy efficiency and renewable energy projects worldwide. The report will be available soon at www.unep.org/Renewable_Energy_Investment. This news is from the UN Environment Programme (UNEP) July 7, 2011.